juslyktht: What Do The Delhi Games Mascot And Emblem Signify? As In September 2010 Issue Of Yojana. What Do The Delhi Games Mascot And Emblem Signify? As In/per the September 2010 Issue Of Yojana Magazine. "The logo of the Delhi Commonwealth Games is inspired by the chakra, the symbol of freedom, unity and power. The upward spiral depicts India's growth into a proud and vibrant nation powered by the coming together of her over over a billion people. The tagline "Come out and Play" is an invitation to all to let go of themselves and participate in the Games to the best of their abilities, in the true spirit of the Games, It is also a call to the people of India to play the perfect hosts to the visitors. 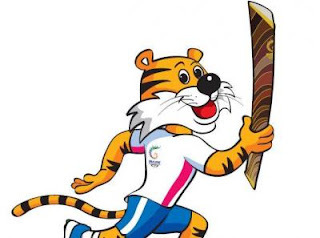 Shera, the Games mascot represents the mordern Indian. He is an achiever with a positive attitude, a global citizen but justifiably proud of his nations's ancient heritage, a fierce competitor but with integrity and honesty. Shera is also a 'large hearted gentleman' who loves making friends and enthusing people to 'come out and play'." I wonder when the above affectation, in terms of significations and representations, will become perceivably righteous. As our politicians and organizers have failed tremendously, in this above said task of really signifying the significance of Delhi games mascot and emblem, the only hopes now, are our athletes, participating in the competition.Now they are the only ones who are capable of turning affectations into righteousness, by performing to the best of their abilities and in the true spirit of the Games at Delhi Games. With the inclusion of Tennis, Archery and Wrestling (Which were absent in 2006 CWGs) in this years CWGs we can expect more medals in Delhi than what we had in Melbourne 2006 (total of 50 medals).